I hope you've had a chance to give scroll flower a go in the past few weeks. This is the last week for this design, so give it a good stitch out. 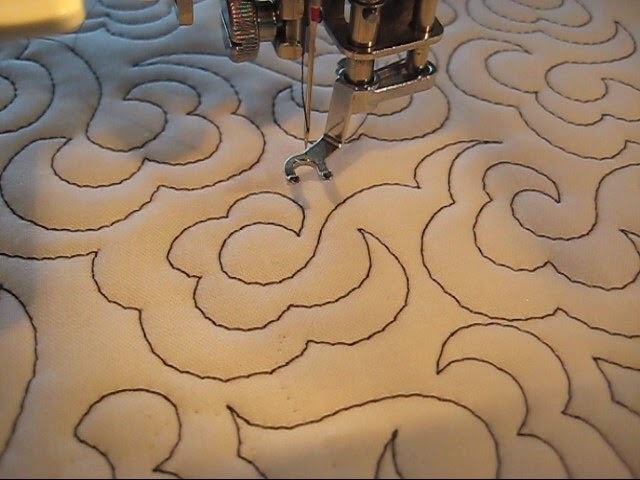 I was intrigued by one of Esther's drawings of this design, see it at ipatchandquilt. So I got out a sample piece (in black!) and stitched out my own take on it in a very colorful thread. I think it would be neat on a modern quilt. Certainly, I left quite a bit unquilted in-between the rows. I think one could nest the flowers closer together or fill in with leaves. With alternating rows, this could work up quickly across a more utilitarian quilt. 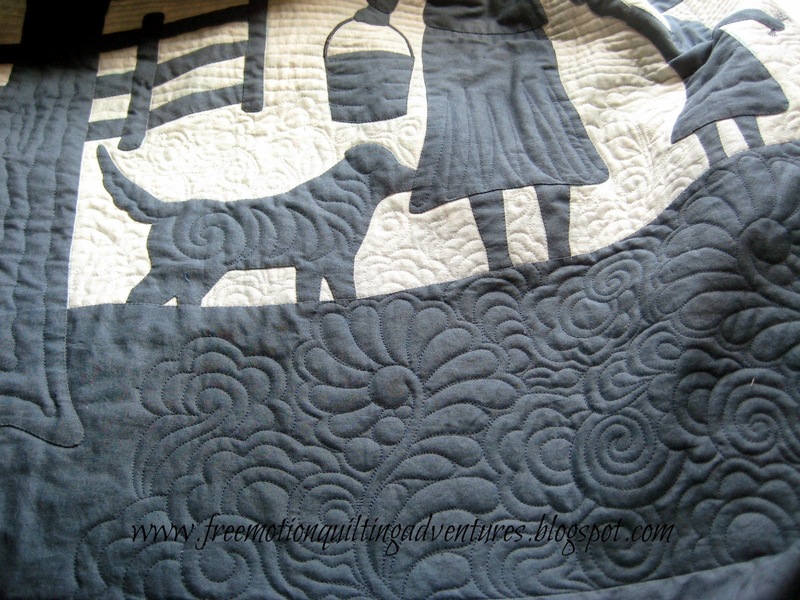 I must remember how hard it is for me to take good pictures of quilting on black fabric! So this is our last linky for this month and this design. I hope you will link and go visiting! I am very excited about May's Free Motion Monday series! I've picked the topic/designs and I have a fabulous giveaway arranged! Don't be a wall-flower. (Talking to myself here too. In person I am so stinking shy!) Visit the other links and leave comments. Visit others who have linked up and be sociable! I can't tell you how happy I am over the Janome "ruler" toe! I love being able to free motion quilt crosshatching with it. I hope to spend the rest of my Friday free motion quilting on my farm quilt, but first a little post on the other adventures I've been up to. I got out the serger and proceeded to cover my sewing space in fine blue fuzz. At least it makes neat seams. I took an online class a few months ago at Craftsy, Beginner Serging, and it helped me figure out all the threads and settings. I bought matching shirts for my kids for Easter and made my girl a twirly skirt. (Note the shirt that my little guy is wearing!) I think she was trying to escape up the tree when I took this picture! I also jazzed up her shirt with some sparkles. I really need to set aside some special time for sewing for her and with her. One side effect of working one day a week at my local Janome dealer is the availability of whatever notion or doohicky my little heart desires. If he doesn't carry it, I can order it. Of course, the other side effect could be spending every dime I make at the shop in the shop! New Machinger gloves so I can have nice white ones for my videos. I did wash my old ones the other day and they look so much better. I used some Dawn dish washing liquid and warm water in the sink. Then the bendable light so I can throw a better light on my stitching. I've seen these at a few classes and the owners loved them. Janome has a new LED version that sticks on your machine, but I wanted to be able to move my light. Air erasable and iron off too? I've got to try it out! I'll share my results with you eventually. Anybody else try this before? Now back to my farm quilt and curved crosshatching. Look for a new YouTube video on this design sometime this week and another speed quilting video! The speed quilting version is solely for entertainment purposes (mainly my own! ), don't think I quilt fast at all. But it's kind of nice to set the time lapse function and take my time quilting and know that the video won't be too long and I don't have to worry about speaking! It does help show the order of stitching for all of the crosshatching though. Note: There are Craftsy affiliate links in this post. I do recommend that if you are interested in the notions above, to shop your local quilt shops first, before turning to the online giants. I ran off to my local quilt guild meeting Monday night. (The line from the movie, "O Brother, Where Art Thou" pops in my head about the boy's mom "running O-F-T" when I say that) Frances Calhoun was presenting her applique work and it was beautiful! The detail in her work is just incredible! I didn't realize I had my camera in my purse until after most of her bigger quilts had been shown. But I did get a few to show you with her permission. George, below, may have been done by machine, but most of her applique is done by hand as is all her quilting. Her mariner's stars/NY beauty type blocks are all traditionally pieced too, no paper piecing for her! Her style is different from mine, for sure, but we both agree that "our way" is just what works for us and each of us has to find our own way. I have had an increasing interest in applique as I think it's a great medium for creating quilts that let my quilting really shine. I'm all about the quilting! 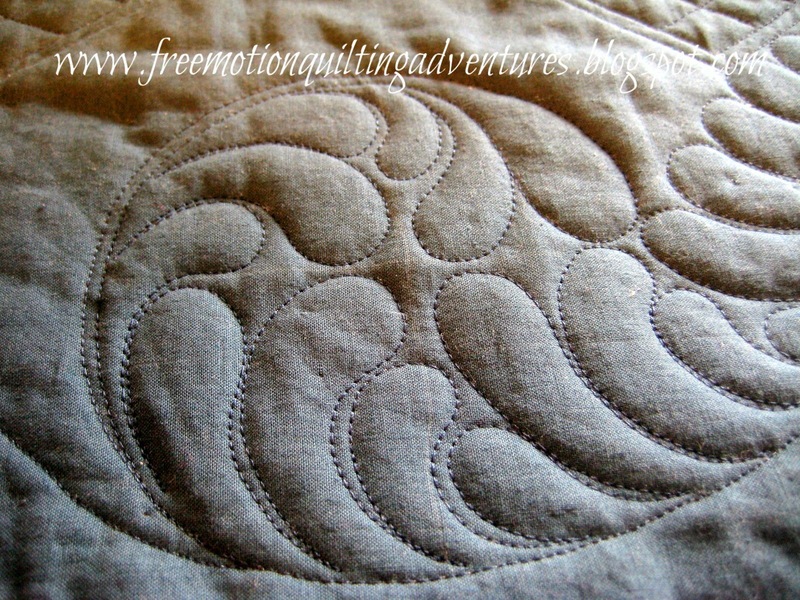 I've got to admit I almost didn't get this week's Free Motion Monday Quilting Adventure post up! It's been such beautiful weather here and I didn't want to spend more time at the computer. I had a few folks mention that they were having trouble spacing the scroll flowers in such a way as to keep odd areas filled in. So I shot another video on the design and I hope it helps you with how to work the design closer together for an even fill. If you are new to this design, draw it out a few times before starting to quilt it. Link up to share what you've done this week with this design, even if it's just a drawing. We can each work on our skill with this design and see how much each of us has improved. Link back to this post somewhere in your post. You've got to dance with the one who took you to the party, so make sure you link back. You can use my button for this series on the right sidebar or a text link in your post, or even both. 'Garden Gal' asked for video showing how I knot and bury threads when I free motion quilt. I was happy to oblige! Now, back to quilting on the farm quilt, if I can! Why must there always be dishes, laundry, mouths to feed? My parents have run off to Paris for a 30 year wedding anniversary trip, and I have suggested that next week my hubby should take the kids to their house so I can quilt with no interruptions. Craftsy is having a big sale this weekend on fabric, yarn, and kits! Big hugs to all of you who peek in at my quilty world and enjoy sharing my free motion adventures! There's a bunch of you and I am blessed by you! May you all have a lovely Easter or Resurrection Sunday. Another week has flown by and it's time for the Free Motion Monday Quilting Adventure, featuring the scroll flower design. I've said you can size this to fit any project, from background filler to large motif. So I decided to do a project to show you a larger version. I've got all these samples sitting around my quilting area. Recognize this McTavishing from last month? My hubby has mentioned our hot pads were in sad shape and so it was time to make a few new ones. I cut some old sample quilt sandwiches into 9 inch squares and layered them with a square of pretty fabric and a seamed piece. The seamed piece isn't stitched in the middle, so I can turn the square right-side out through it. Trimmed the corners first, then turned and pressed each hot pad, top-stitched around the edges, then I quilted them. The first one I quilted a bit off center and filled in with some leaves. 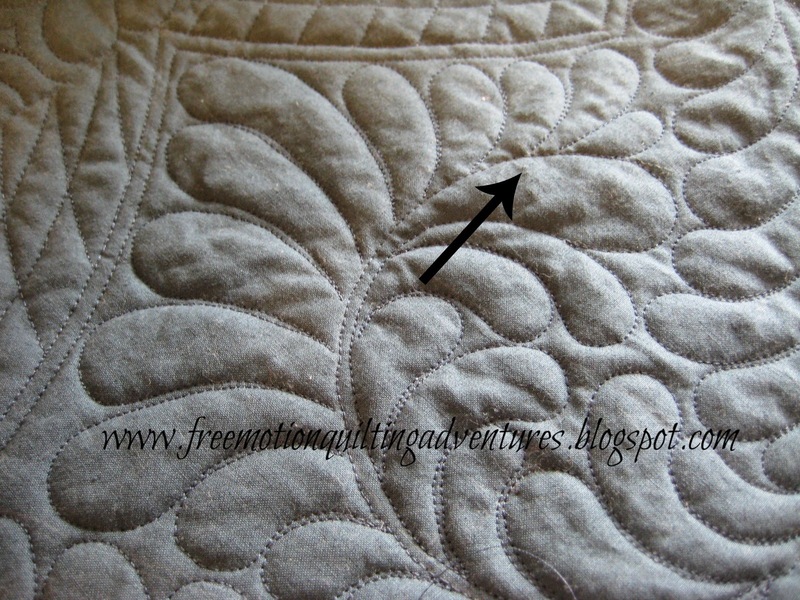 I marked the center of the rest before quilting as a target for the center of my scroll. This kept the design much more centered. And I finally made a button for these Free Motion Mondays! If you want to use the button on your blog to show your participation in these quilt-alongs, or would like to put the button on your blog, the code is on my right sidebar. I promised myself several months ago that I was going to work on smaller projects for my free motion quilting adventures and yet, I agreed to this commissioned project. Silly me. Then I went and designed it with huge borders! I am making the finish of the farm quilt my number one quilty priority and the push is on to accomplish the goal so I can move on to any number of ideas I have rattling around in my addled mind. I am marking these 12 inch wide borders now. 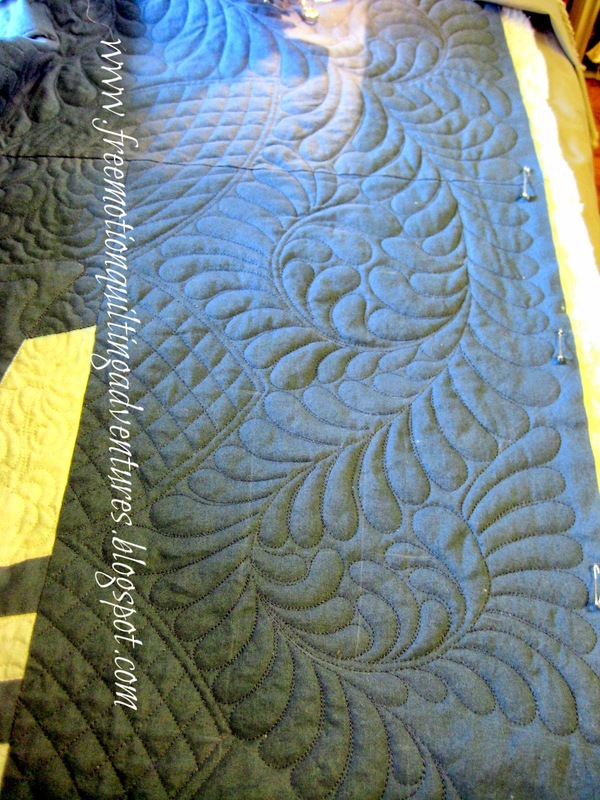 Kimmy Brunner sure makes it look easy in my Craftsy class, Machine Quilting with Templates ! I think I need to order a few more templates from Accents in Design as I think I need the larger sizes for borders like this. I want to do some curved crosshatching and feathers in the border. I've figured out the placement of the curved crosshatching, but I still need to figure out how to run the feather spines. I needed to divide segments by 3-7/8 inches, so I used painter's tape to easily find the makings on my ruler. I'm using chalk to mark my lines. I am kicking myself for not picking up one of those chalk mechanical pencils that makes a nice fine line when I was in town yesterday. Updated Saturday to add: Craftsy is doing a sale this weekend on selected classes! My free motion quilting adventure has taking me to the farm! I've been working on this quilt for far too long and it's time to "git 'er done" My client and friend (very understanding, patient, dear friend) wanted to gift another friend something with a farm theme, but not a cutesy quilt. How often do you get to quilt a chicken, a dog, and even a leaky water trough? I quilted in some McTavishing to represent the water spilling out of the trough. 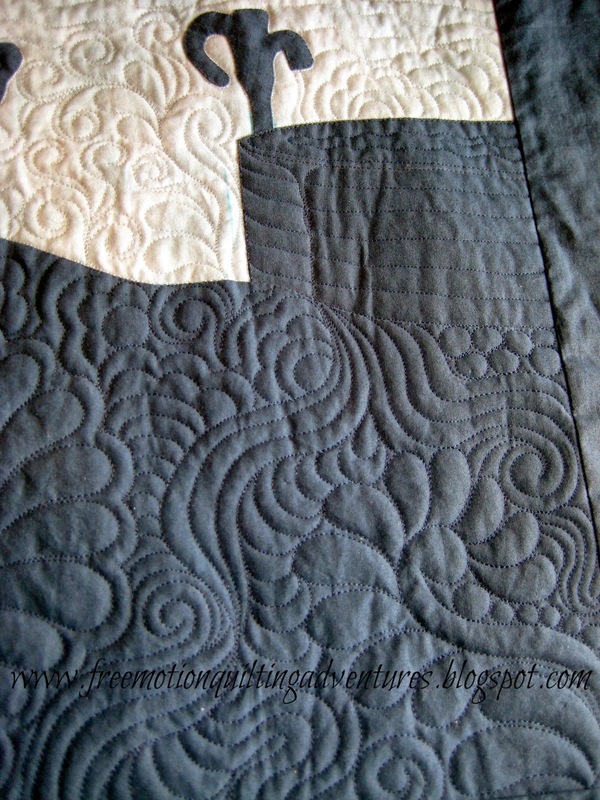 I really enjoyed this overlapping flower design that I worked into several parts of the quilt. I think it would make a great overall design. It reminds me of a Baptist fan design, but with a flower. This quilt is the biggest thing I hope to make for a while. I had told my friend that I wasn't going to make anything big for a while, but she really wanted a bed quilt. This is a bit of a compromise, 72x72inches. Big enough to lay out over a bed, but not entirely enough to sleep under. Now I need to mark and quilt the border. I really enjoyed this project, but I need some smaller projects so I can get the satisfaction of more completed tasks and projects to balance the frustrations of never ending dishes, laundry, etc. I am feeling very spread thin trying to keep up with all the things I've got going on right now. I'm having a little trouble keeping up with my email and responding to comments, so please forgive me if I don't respond to every comment. I do read all of them and they help me keep writing this blog. I try to answer all the questions that I get in comments, so keep 'em coming! So, now I've got a question for you: Do you have a special method that helps you schedule or keep up with a busy life? I need to tweak what I'm doing. (Homeschooling, working from home with blog, quilting, etc. Plus the typical appointments and to-do lists) I prefer a calendar on my wall and a huge dry erase board- both aren't very portable! But I'm afraid of going digital- wondering if it will be visual enough for me. Thoughts? 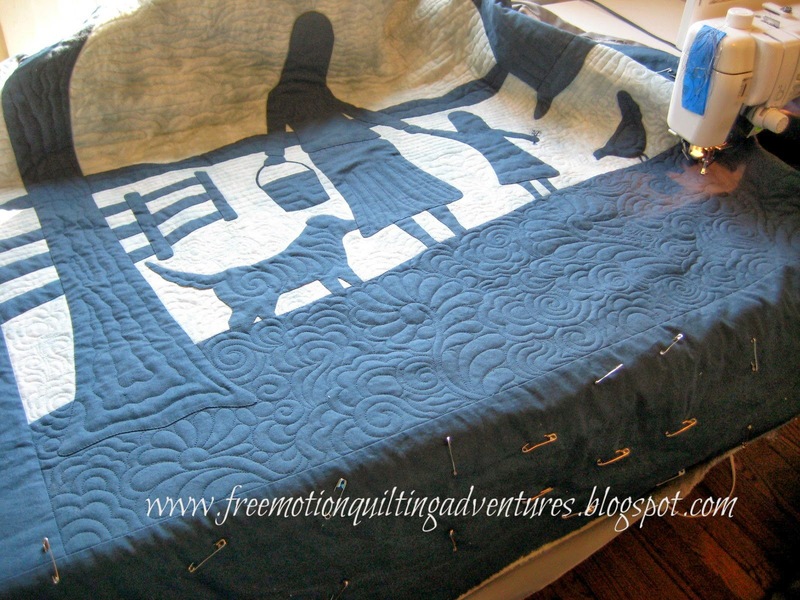 Time to start a new free motion Monday quilting adventure! Never mind April showers that bring May flowers, we're going straight to the flowers for the month of April! I'm sure there are other names that this design goes by, but scroll flower is what I will call it. This is a great design that can be scaled up really large- maybe up to 6 inches wide, for an all-over, edge to edge type design. It can work in a small scale for use as a filler and you can fit it to a block to use as a block design. So it starts with a scroll shape. Some folks think it looks like a question mark.Then you add petals. These are pretty much a semi-circular shape, bouncing around the circular portion of the scroll. The size of the scroll and size of the petals dictate how many petals you'll have. Conversely, the number of petals you desire and the size of your scroll can determine the size of your petals. Then you bounce back around to create another set of petals. I like mine to just echo the first set. And then off you go with another scroll to start the next flower. You can vary the direction of the scrolls to make the flowers more random. If you are new to this design, draw it out a few times before starting to quilt it. Link up to share what you've done this week with this design, even if it's just a drawing. This is the baseline week, so that we can each work on our skill with this design and see how much each of us has improved. I don't have a give-away set up for this month, but I'm trying to set up something for next month. I'm working on a new button that will be good for all of these Free Motion Monday Quilting Adventures, but my computer seems to hate me right now, so that will have to wait. Dear readers, forgive me for this odd post, but I have found no other way to address a problem. It seems a site called Quilt Patterns Pro is posting entire blog posts from my blog without my permission. Now, I don't mind getting my content out in front of as many interested folks as I can, but I like for those folks to be directed back to my site! That's why I listed my blog with www.quilterblogs.com, a content currator, where they show my blog along with many, many others. But they only show a portion of each post and there's a link to send you to MY blog to read the rest. And you can follow me through Bloglovin' and Feedly too. I can find no contact info for the site. But I can find adsense ads sprinkled into some of the posts on the site that belong to other bloggers (who appear to have their content scraped as well--- scraped is a euphemism for stealing content. Though so far I find no ads added to my posts. Links to other sites (including occasional affiliate links) that I have put in my posts seem to still be in my posts and working, though I will not click on them from that site to confirm it. Now, my brain is not entirely reliable sometimes, especially when it comes to what sites I have visited and what series of buttons I have pushed in the past to do some really neat stuff with my blog. But I can't find any way to sign my blog up with this site, even if I wanted to, so I doubt I have volunteered my content in the past. So, dear reader, if indeed you are reading this post at Quilt Patterns Pro, come on over to my actual blog! 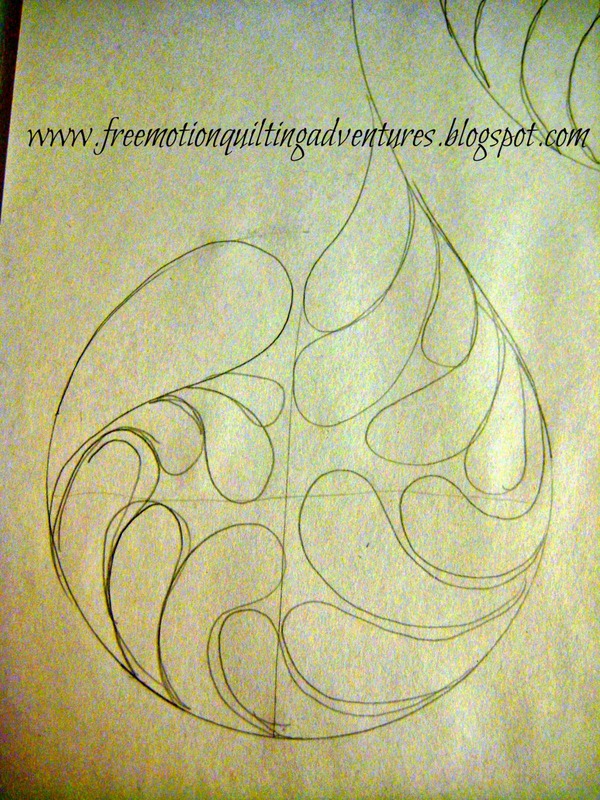 Amy's Free Motion Quilting Adventures (www.freemotionquiltingadventures.blogspot.com) There are a lot of great resources, tips, and videos for free motion quilting and quilting in general. You can even interact in the comments with other readers and with me. That is something this other site hasn't allowed. And if you enjoy the posts of other bloggers on QPP, you might want to find their actual blog too, as I bet you're missing some of the best features of the real blogs! And if there's a chance a real person affiliated with QPP and not just a program or bot is looking at this post, please stop posting my content! I'd like to hear from you if I've misunderstood this situation too. You'll notice that I did not link to QPP's site. I'm not sending them any traffic if I can help it. From time to time, I have found my content used this way (stolen) on some real sketchy websites in an obvious attempt to get traffic to a very spammy, advertising heavy site. Most of the time the language has syntax errors or is foreign or there are other formatting errors. There are always plenty of cues that will tip off a reader that if they are really interested in what I have to say, they should find my real blog. This one is different. It looks legit. I hate that there might be readers of my posts with whom I have never heard from or been able to answer a question for them. And yes, I'd like to have that relationship and that traffic. It takes a lot of time to keep up this blog and produce the projects and the videos. (Boy do I type slow!) The interaction with readers is my prime motivator, but occasionally I make a little money from the blog and it's a tiny little reward for my efforts. QPP----come up with your own content or at least learn to currate (if that's how you justify it) correctly! 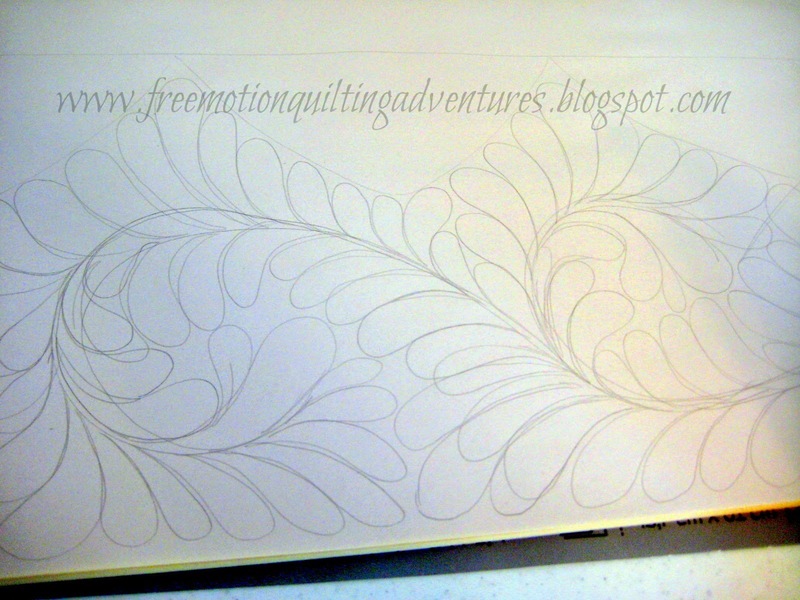 It's been a while since I've had a complete and total free motion quilting Ah-ha moment, but I had one today! I ordered Deborah M. Poole's book, "You Can Quilt It! " and it hit me when reading about stitching feather spines. There's a spot where she talks about stitching the spine first, then stitching up one side and ending in a tear drop at the tip. Ding, ding, ding! We have a winner! See, I have been stitching my spines first, but I start them off with the tear drop at the tip. Nothing really wrong with this, but it means I have to match up the plumes on both sides of my spine with the already drawn teardrop tip. Granted, these aren't the best feathers I've ever drawn, but see how it's a bit awkward there at the tip? I am so glad I can actually stitch better than I can draw! If you're new to FMQ, don't despair at your drawings. Now above, I just drew the spine, not the teardrop at the top. That first side worked into the teardrop much more smoothly as the end of the plumes. Then I only had to work in the other side. What a great tip! I am so glad to have gotten my hands on this book. Deborah is a frequent poster on MQResource.com where I have learned so much from so many longarm quilters. She even made sure to have the book done with a spiral binding so it will lay flat for referencing a design when quilting. While I know there are some inherent differences between longarm quilting with a moving machine and a sit-down machine while we move the quilt, I've found that there is a lot to learn from great quilters, no matter how they are quilting. Deborah is an excellent quilter and loves doing feathers and ruler work, which is what I love. So I've learned even more from her book. Have you visited my ruler work page and posts? I hope to get some ruler work posts done in the near future, and of course get the next free motion Monday link party going!